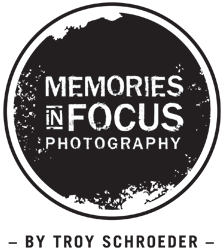 Have your calendar handy and call Memories in Focus at 515-576-0764 to schedule your session, consultation, and order appointment. The session fee payment is required to reserve your photo shoot. About 2 weeks prior to your session we'll meet/call to discuss your outfits, customize your session, and view our product options. This 30 minute meeting is quick & easy. It will help eliminate any pre-session stress and we have gifts!!! During this visit you'll select how you'd like to view and order your photos and pay the proof deposit (if applicable). Arrive at your scheduled time and be "camera ready" - Have your hair and make-up complete. Don't forget to pack appropriate garments, shoes, belts, accessories, and all items needed for touch-ups. Tip: Have your outfits on hangers and we'll meet you at the door with a garment rack! Orders must be placed within two (2) weeks of receiving your printed proofs. Orders take 4-6 weeks. We will call you when your order is ready to pick up. Please note: It's our policy to have a parent or guardian present at all appointments.